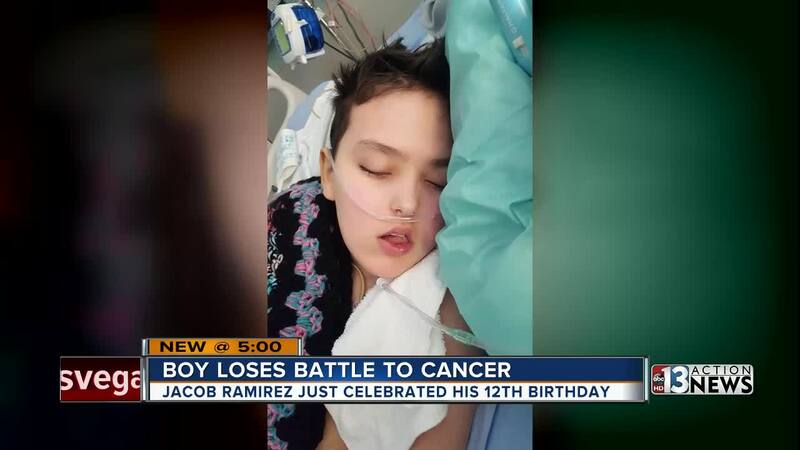 A heartbreaking update on Jacob Ramirez, a Las Vegas boy who was struggling with one of the worst forms of childhood cancer, as his family says he passed away Saturday. The 12-year-old battled brain cancer for two years and now his parents are raising awareness of the disease that killed their son. According to family members, Jacob Ramirez had a contagious laugh and was always energetic. Tammi and Angel Ramirez said their son was always full of life. "He did everything he possibly could until he couldn't," Tammi said. "He fought so hard." Jacob was fighting a deadly childhood cancer called DIPG. The child's mind is perfectly intact but they lose all their abilities and motor function," Angel said. On Saturday, Jacob passed away and his family was beyond devastated. "No parent should ever have to see their child's last breath," Angel said. Now his parents are using their unimaginable experience dealing with the disease to help others. "I started a foundation with a friend. It's Jacob's Hulk Strong Brain Cancer Foundation, so we wanna help other children and families in this situation," Tammi said. The foundation named after Jacob and his favorite character, the Incredible Hulk, are both a symbol of strength and have already helped two families who are also dealing with similar situations. It's never going to be easy to accept the loss of a child. But if it's any consolation, the family knows Jacob is no longer in pain. "Love you, buddy. And you will always be missed," Angel said. The family has also set up a GoFundMe page to cover expenses for Jacob's treatment and funeral arrangements.